Stains on asphalt roofing shingles are not only a cosmetic issue. They can be a symptom of a bigger problem that could lead to serious damage or roof failure. However, there are some steps a homeowner can take to remove stains and see if there is a underlying problem at play. Eroded Mineral Surface – If the roof-covering material has been on the house for 15 years or so, it could be that the surface granules are wearing off the shingles and the asphalt base is starting to show through. On older roofs, you may additionally see cracked and/or shingles with curled edges. If you determine that age and wear are the causes of darkening, it may be time for a new roof. Algae Growth – More often than not, blue, green or black stains on an asphalt-shingle roof are caused by algae. Algae staining begins with small spots which, over time, can develop into streaks. Algae stains, which are often mistaken for mold or mildew, aren’t harmful to anything other than the appearance of asphalt shingles, but nobody likes the look. Moss – Green, velvety masses of moss often grow on north-facing roof surfaces and on tree-shaded roofs. 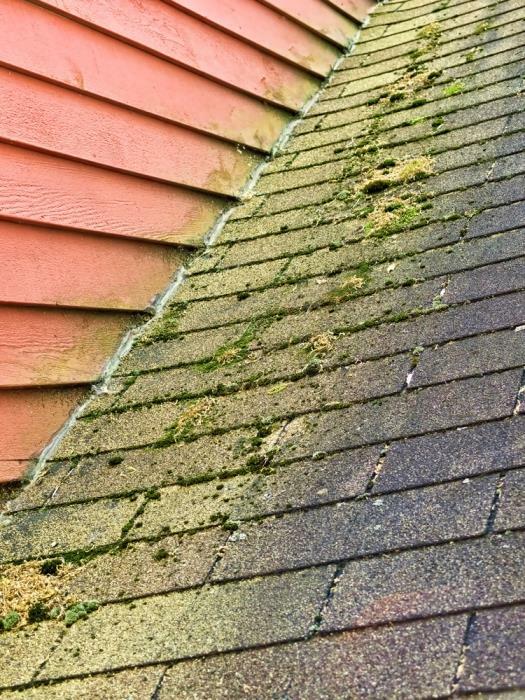 Unlike algae, moss left on roof surfaces can develop beyond an aesthetic problem. It can infiltrate the roof structure underneath the shingles and make their edges lift and curl, which can lead to cracking and blow-off during high winds and storms. 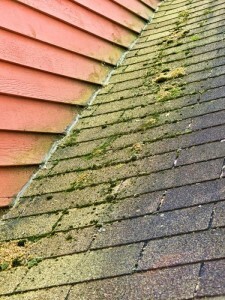 Heavy moss growth can actually form dams that can cause water to back up under the shingles and damage the roof deck. It’s best to clean moss off a roof as soon as you notice it’s growing there. Consider using a safety harness and follow common-sense rules considering positions and using a ladder. Don’t do it alone. Have somewhere there to spot you.